When the cancer treatments stopped helping Sally Graul's metastatic breast cancer, she stopped traditional meds — for now. But she's not giving up. 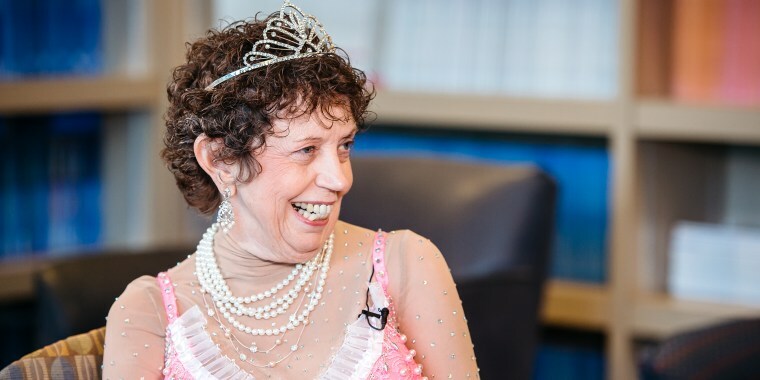 For her last day of radiation for breast cancer, Sally Graul picked out the perfect outfit: Pink harem pants, a tiara and a pink bra covered in pearl-like accents and adorned with white fringe. Graul, 73, calls this her “princess outfit” and felt the end of almost two decades of breast cancer deserved a look. Friends joined Graul as she rang the bell officially signaling the end of treatment. But there’s a catch to this celebration. Graul isn’t in remission. She has metastatic breast cancer. Over the past year none of the treatments worked. So she’s quitting — for now. While some might think this sounds like giving up, it’s absolutely not. In 2002, Graul discovered two lumps in her breast, which turned out to be carcinoma in situ, the earliest stage and least invasive type of breast cancer. Doctors performed a mastectomy and they believed they removed it all. For almost a year and a half, Graul was cancer free. But then a routine checkup uncovered another tumor, which doctors then removed. This time Graul went through 35 rounds of radiation. Following radiation, doctors did a PET scan to give her an all clear when they found a new lump in her armpit. “The cancer cells do mutate and fight against these medications,” she explained. As she continued treatment, she discovered a group of breast cancer survivors who supported one another by going camping and fishing. Graul joined them for a trip to Pumpkin Hollow, Alabama, where they fished from boats, shared meals and joked. Graul completed more chemotherapy and for three years she was cancer free. She continued hanging out with her support group, whom she calls "the Sisters,” visiting bed and breakfasts, camping, fishing and dancing. “We just have an absolute blast,” she said. Then in 2007, the cancer returned. This time it was metastatic breast cancer, Stage IV, which is considered un-curable. According to the journal Cancer Epidemiology, Biomarkers and Prevention, about 155,000 women in the United States live with metastatic breast cancer. The American Cancer Society estimates that almost 42,000 people annually die of breast cancer, most of whom have advanced stages of it. “When you get that diagnosis, it is devastating,” Graul said. Yet, she never let it slow her. She kept working and spending time with the Sisters. When her neighbor, Kristen Noles, was diagnosed with breast cancer in 2010 at just 34, Graul was the first to step up. While Graul’s kindnesses helped Noles as she underwent treatment, Noles gained strength from simply observing Graul. “She does it so gracefully. When she gets hiccups on the journey, it is not that she says, ‘I am a victim. Woe is me.’ It is, ‘When am I going to do the next thing?’” Noles explains. “That is very powerful." Even though Noles has been in remission since 2011, she’s remains close with Graul. "Sally is more positive than ever," Noles said. "I see her as a brave warrior." After consulting with her doctors, family and the Sisters, Graul felt it was time to quit traditional cancer treatment. But she’s not giving up: She is pursuing a second opinion and hoping to qualify for a clinical trial that might slow the cancer. But that doesn't mean she'll try just any treatment. “I want to go forward cautiously,” she said. "I don’t want to be extremely ill."
Jennifer Hicks, a palliative care manager at the University of Alabama at Birmingham, joined Graul for her last radiation session. She believes Graul’s choice likely will make her happier. Graul is definitely not slowing down. She has loads to accomplish: She wants to zipline, dance more, take a trip to the Pacific Northwest, return to where she grew up in Johnstown, Pennsylvania and visit Washington, D.C. And, there are the six grandchildren and one great grandchild she’d like to see grow up. Recently, she treated herself to a Lincoln MKZ, in part, because Matthew McConaughey is commercials, and she thinks he’s hot.